WowWow Wubbzy has to be one of the cutiest characters on TV to watch. My Son just loves to watch Wubbzy and I love that it good for him to watch. It seems in each epidode he watches there is always something to learn. I was thrilled to be asked to review WowWow Wubbzy and the Fire Engine. This six episode DVD follows the yellow guy and his friends, Widget, Walden, Daizy and more through fun and colorful adventures. Ty Ty the The Tool Guy (voiced by Ty Pennington of “Extreme Home Makeover”) helps them build a house, Wubbzy learns the importance of not playing with a real fire engine, and they help Daizy deliver her doodleberry treats! My son loved this. For one he is fascanated with anything to do with fire engines and fireman. 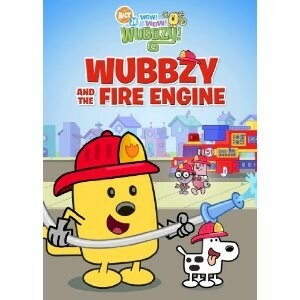 Seeing Wubbzy as a fireman was great. He was grinning ear to ear with excited to watch it. He is four so it did take him a couple days to get through all the episodes but he loved them so much he was his Daddy all about them. I think he has watch them all a few times now. In each of the six episodes on the fantastic DVD your child will learn the importance of dealing with conflict, how to express themselves, and how to work together with others. There is also plenty of singing and dancing to get those little ones up on their feet. Wubbzy will always be welcome in our home. Be sure to check out their website for lots of activities for your kids. I am thrilled that the great people of all things Wubbzy are giving one of my readers this DVD. Your kids won’t be disappointed in these episodes. Giveaway ends 1/4/12. US Residents only. Good Luck. I was googling wubbzy and came across your blog! Katrina´s last blog post ..I Now Have Two Flowers!!!! Leslie Loves Veggie’s on twitter! I found about this from Giveaway Promote. Found out about it on twitter! I actually came across it on Twitter! I found you on Giveaway Promote. I found out from Giveaway Promote Daily email. I found this on Giveaway Promote. Adalia´s last blog post ..Feliz Navidad y Prospero Año Nuevo 2012! zene´s last blog post ..We have a winner!